The life of gaming is lived in milliseconds. That is all you need to make the difference or be trashed into the can of the rest. That is why a serious gamer wants the best mouse, gaming monitors, gaming chairs, gaming computers and the best of everything else. 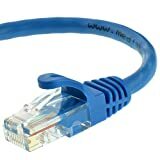 There are things you need to understand to get the best Ethernet cables. The first is to understand that they come in different categories; Cat-5, Cat-5e, Cat-6, Cat-6a, Cat-7, and Cat-7a. For gaming and other professional uses, from Cat-6 above will be the better, and the Cat 7 and 7a are the best. They are the newest also. You will need to consider compatibility as well. Most OEM branded cables have better compatibility. One thing that isn’t too important but useful to consider is the length because the shorter it is, the faster the connection. This is, however, not by a great measure, and it is only because of the higher latency you get with distance. One of the things that stand this out from the larger market is that it is a cable that is in the category 7 class (Cat 7). What this means is that when it comes to speed, it is the one to top your competition, and definitely one of the best Ethernet cables. The cable is able to transfer data at as much as 10 GB per second at a frequency of 600MHz. Even as this is hardly catchable by most others, what is even better is the fact that it is double shielded. What this means is that there is the protection of data from Electromagnetic interference (EMI) and radio-frequency interference (RFI). Another fantastic thing about the cable is that it is thick and very durable, hence you will get to use it for a generous amount of time. It comes with 50 Micron Gold Shielded RJ45 Connectors and Contact Pins, and it is compatible with Cat-5e / Cat-6 / Cat-6a Ethernet Cables. The Tera Grand Premium CAT7 is not only one of the best Ethernet cables, it is also the strongest. It will serve someone who has been baptized into long gaming and streaming because it is both fast at 10 Gbps and reliable. 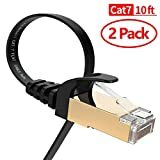 Supporting up to Cat6, this cable is definitely one of the most favorite among many people and looking at its quality and what it does, it will be surprising for one to expect anything less. Because it is supported by a Cat6 port, you are able to get as much as 10 Gigabits per second, which is overwhelmingly crazier than what you will get with Cat 6 cables. It has a 550MHz frequency and it is compatible with RJ45 jacks. The Mediabridge cable gives a universal connectivity for various components including routers, switch boxes, network printers, VoIP phones, PoE devices, and network attached storage (NAS) devices. More so, even as the build may not promise forever, it is very good. Like most cables that are very long, you will expect that the cable will come very untidy. Nevertheless, with this cable, there is a Velcro strap that keeps it in check. Another thing that the Velcro strap does is to make the cable very easy for storage. 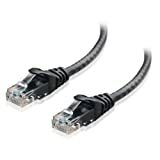 One of the main problem gamers have with Ethernet cables is that they are prone to break in connection. This is where this again performs better than many others as it holds the connection whether you are streaming, gaming, or you are just surfing. For a gamer that wants more than what mediocrity can afford, this may just serve. This is why most people go for the cable. It is fast, durable, and has wide connectivity. I don’t know what can be better. The Vandesail is another that will give you a very fast and smooth sail. It comes with 2 connectors RJ45 and gives you a speed of up to 10Gbps with a bandwidth of 1000MHz. Similar to the Tera Grand, this also keeps you protected from EMI/RFI interference thanks to its shielded connectors. Overall, this is a cable that will serve you whether you are a PC gamer or you have a console. And yes, if you have places that are hard to reach, you can decide to try this cable because it is a flat cable designed to minimize space. It is also very easy to wrap and carry around even if you are traveling. If you have more than a connection to make, this may just be a wise choice. This is because it offers more than a single cable and it is very fast and durable. It is also for someone looking for a convenient piece to carry about. Coming with universal connectivity for almost any of your gaming console or pc, or even other things, this cable is designed with gold-plated contacts and molded strain relief boots. It also has a Snagless mold to enhance its overall durability. It has a bandwidth of 550 MHz and a speed of 10 gigabytes per second. This will ensure that your game meets every millisecond you need to make a difference in most games. The cable features good technology including to ensure that the connection is not interrupted while gaming and keep the integrity of what you are doing by ensuring you don’t get any interruption thanks to its Snagless mold. Even as the cable is durable, I didn’t find it to be the most flexible. Now, that is not to suggest that it is not flexible at all. As it is, it will be a hard run for it to beat others on the list. Although it offers a Category 6 performance, the cable is much cheaper and goes for what you get some Category 5 cables. One of the best things about this is the technology behind the construction. What that does is to improve everything about it. Hence if you are looking for an intelligently constructed RJ45 cable that is easy to plug and unplug, and use generally, you have a winning bet with this. The Jadaol Cat 6 Flat Ethernet Cable is a 100 ft. Category 6 cable that gives a great gaming and general streaming performance. It is designed with Snagless Rj45 Connectors and delivers a 250 MHz performance. The connection speed is very generous. According to Jadaol, the cable is great for Fast Ethernet, Gigabit Ethernet, and 10-Gigabit Ethernet. Featuring an Unshielded Twisted Pair (UTP) cable, there is minimal interference, even though it may not protect you as best as a shielded one. Nevertheless, it serves you best for short and medium connections. Nothing stops it from serving long connections but I will go with the medium. 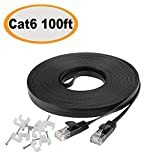 As a flat cable, this is easy to use from a room to another, and the quality is fairly good even though it is ultra-slim and can easily run under your carpet. There is professional touch to both the make and the packaging. 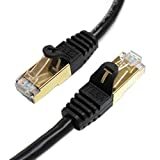 Looking at the compatibility of the cable, it takes Routers, game consoles, PCs and other computer components, network printers, and other things. Like many other flat cables, this is very good if you need something to save space for you, or if you need to run it between rooms. More so, it is a fast cable that makes every gaming second count. Mediabridge Ethernet cables are among the best you can get out there. With this Cat 6 piece, what you get served is a cable that performs Up to 550 MHz and ready to deliver as much as 10gps. With that, it is obvious that the performance is good like other Category 6, and even better than some. More so, signal loss is one thing that is minimized greatly with the cable. The build of the cable is interesting as it is thick and done in a way that achieves durability. Even as you may get that, you may not get the kind of flexibility you will get with other flat cables. The gold-plated contacts connectors are also designed to be durable and easy to put in and take out. It is compatible with devices that have RJ45 jacks and it gives universal connectivity so you can have it on your gaming laptop, Xbox, network attached storage (NAS) devices, VoIP phones, and PoE devices. Has Velcro cable strap that is reusable. Designed for future-proof speed and reliable connectivity, this is a cable that has proven itself to the stiffness of the competition. It is highly recommended for someone looking for something decently priced and something to keep up with the competition when it gets crazy. At the end of the day, you will be hit with arguments from people insisting that cables do not affect the speed of the internet. Trust me, they do, and that is why everyone serious with streaming or gaming will always find the best Ethernet cables. There are, of course, other things that influence the speed of the network, but having a good cable solves a lot, and puts you in the right spot. PS4 Slim vs PS4 Pro: What Is The Difference, Which One Should I Chose? What is The Optimal or Ideal CPU Temperature For Gaming? When is The Best Time To Buy Computer Parts or a Laptop? AMD Ryzen vs Intel: Which CPU is Better For Gaming? Xbox One X vs PS4 Pro: Which One is Better and More Powerful? Injustice 3 Release Date, News and Rumors – Would There Ever Be One?